Completely pre-assembled and ready for installation. Savings up to 30% of thermal energy. Payback period, as low as 12 months, depending upon the fuel used. All components which will come into contact with hot air are of SS304. Economical even for small machines, due to modular design. 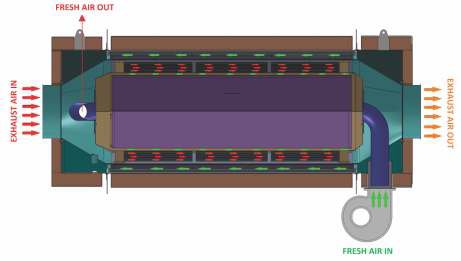 No reinforcement / replacement of exhaust fan required even at the time of retrofitting. 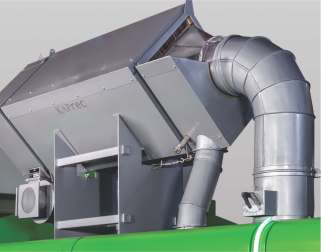 Can be easily retrofitted into the existing exhaust ducts – no large scale / expensive re-ducting required. Heated-up fresh air directly fed into the stenter compartment that leads to virtually no heat radiation loss. 50mm thick high density insulation is provided inside the HRU to prevent heat loss even when exhaust air is passing through HRU.